We are the American national society devoted to origami, the art of paperfolding. Origami is for anyone, anywhere, any time! Our website is the place to find easy diagrams to fold from, shop from our broad selection of origami books, paper, and downloadable diagrams, and find events from our calendar such as our fantastic Conventions that bring folders together from all over the world. 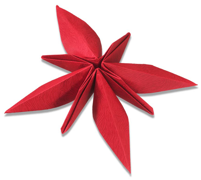 Find an origami group near you or read our online magazine for more diagrams and great articles. Join us and you receive our print magazine. Experience the joy of paperfolding! The newest downloads in The Source.